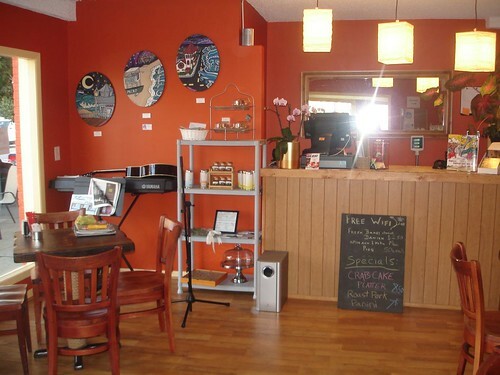 Malelani is a cafe in Ventnor, NJ. Open since last Memorial Day, Malelani has a very unique feel. Their open mic is held on Saturdays, and are supposed to start somewhere past 7pm. They wait until more people show up. Starting with the good parts: Everyone that works at Malelani is awesome. I specifically talked to Steven Winklestein and he’s an awesome person. He’s a self-proclaimed writer of mystical prose and poetry, and has recently published a children’s book entitled “Elephant, Elephant, Come Alive!” about Lucy the Elephant. Honestly, Steve is a cool enough guy and I hope he sells so many copies that he needs to make more. Everyone else I encountered was very nice, and on a separate occasion I was even invited to smell the teas before I made my selection! Yummy. The tea was very good, and the atmosphere is warm and cute. Inside of Malelani, looking at the "stage"
Now for the rest. I review open mics. Onward. It’s my opinion that Malelani would be best enjoyed if you were accompanied by a large group of your close friends. While it seems this advice might be suitable for any mic, it goes for this one at least twice as much. I showed up at the open mic at 7pm, and the first performer sang at 9pm. There was no announcement starting the open mic, and there was no sign up sheet. Performers weren’t given a time limit, and in the one case, a performer took it upon himself to play for an hour. It may “only” be an open mic, but that kind of behavior is lunacy outside of being a featured act. So in order to keep myself from sounding like a stuck-up soccer mom (and also in order to follow Thumper’s rule), I’ll stop for now. Normally I have a separate post for the pictures from the night, but there were only a few, and I left after I realized there was a rockstar in the house. Update: Steve called me to let me know that there will be a 3-4 song limit and a sign up sheet next week. I think it’s great that a company can be humble enough to take on suggestions and implement them swiftly. 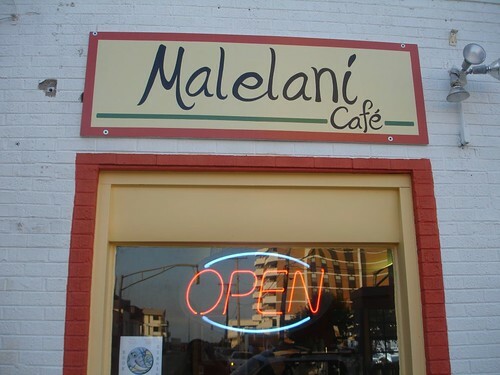 Hoorah for JerseyMic and Malelani Cafe! This entry was posted on August 6, 2009, 7:00 am and is filed under Reviews of Open Mics. You can follow any responses to this entry through RSS 2.0. You can leave a response, or trackback from your own site. Thanks for the press… Very fair review and we take our customers’ suggestions seriously! This weekend: Sign up sheets and a 3-4 song limit for performers. As far as the first performer going on at 9pm… well, that’s up to the musicians. Steve: I will add an update at the bottom — it’s very cool that you’re responsive and also active in making Malelani a better open mic venue. Just want to add that Steve and everybody else at Malelani were very supportive and helpful. No pressure, all levels of play, great response from others waiting to perform. Very laid back but that’s not a bad thing. I intend to make it there as often as possible and I’m reccomending Malelani to everyone I know. And since they are a coffeehouse it’s good to know they brew a great cup of coffee. Paul, I’m glad you enjoyed it! I read this review a long time ago but forgot to tell you how awful a writer you are. If you ever want to be taken seriously, I suggest you improve your syntax. AncaAugust 23, 2010 5:31 pmMakes me wish I’d been vegan when I vtsiied Berlin. Guess I’ll have to go with my backup plan: moving to Berlin as soon as possible. Pretty element of content. I just stumbled upon your website and in accession capital to claim that I get in fact enjoyed account your blog posts. Any way I will be subscribing to your feeds and even I fulfillment you get right of entry to persistently rapidly.